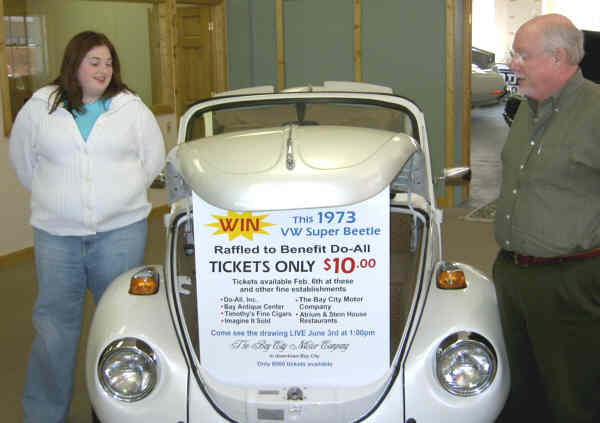 David F. Cotten and receptionist Kara Hennessey show off a 1973 VW Super Beetle for which tickets are on sale for a June 3 drawing to benefit Do-All. If you have half a million dollars you can buy the 1938 Mercedes-Benz that is reputed to have been a German Army SS staff car owned by Hermann Goering's physician. And, you can buy it in downtown Bay City, along with several dozen other classic cars now on display at the Bay City Motor Company. 1120 N. Water St.
Several dozen cars that recall the Roaring Twenties and back to the Gilded Age may tickle your fancy at the new Bay City showroom. Maybe you can even get the Nazi black beauty quite a little cheaper than half a mill; just make an offer. Goering, you mayrecall, was the head of the German air force, the Luftwaffe. He was an obese morphine addict who was so much in favor with Adolf Hitler that der fuerhrer named him his heir. Mercedes-Benz 1938 model Cabriolet, reputedly a Nazi SS staff car, gleams like it was new in Bay City Motor Co. showroom on Water Street. Entrepreneur David F. Cotten, a former St. Louis, Missouri, auto dealer, has the old Nazi SS Mercedes staff car and other cars like a 2004 Ferrari Spyder, 6-speed, with only 1,600 miles on the odometer, on the showroom floor "where it's okay to drool," he says. "We can trace the chain of ownership back to the German doctor," says Mr. Cotten, referring to the glamorous, gleaming Mercedes 230 Cabriolet B. "We know he was in the SS. The car had been commandeered by the SS and after the war, about 1950, it was returned to its first owner," hesaid. The classic was traded in to Mercedes in 1954 and ended up in the possession of a Grand Rapids man who brought it to the U.S. In an ironic twist of fate, the car is now in Bay City, home of one of Goering's guards at the Nuremberg War Crimes Trial in 1946. The guard, a teenage soldier who entered service near the end of the war, wishes to remain anonymous but friends say he was on duty at the prison when Goering committed suicide Oct. 15, 1946. The veteran, now in his late 70s, reportedly has a theory that may solve the mystery about who furnished the cyanide pill to Goering. A German doctor (perhaps the owner of the Mercedes) and an American Army officer are among the suspects, according to friends of the former guard. "Please do not touch. I'm not that kind of car." Sign on many of the classic vehicles in the Bay City Motor Co. showroom. There you can see, and buy if you like, exotic wheels like a 1949 Packard 645, $145,000; 1989 Rolls Royce Silver Spur, $45,800;1974 Rolls, $24,500; 1967 Mercedes-Benz 200D,$8,900; 1999 Porche Boxter, $24,575; 2002 BMW 325CI, $22,100; and 1959 Triumph TR3A, $26,000. There are lots of other more mundane models, Lincolns, Cadillacs, Buicks, VWs, Chevys, Dodges, Fords. How about a 1963 Corvair Monza convertible for only $9,700? Or a 1970 Ford Torino GT convertible, $35,450. A '79 Ford Granada, said "nicest in the country," is fully refurbished and has only 39,000 original miles. Drive it away for $12,500. Oldest car on the list is a 1907 Maxwell while second oldest is a 1930-31 Ford Model A 4 door with Murray Body. Murray had a factory in BayCity just in case you remember. It was on South Sherman near Pulaski Hall. If the name Bay City Motor Co. is familiar, it should be. The first firm with that name was started by Capt. William Mitchell here in 1904. It was the nation's first Cadillac dealership, operating at 313 Third St., just around the corner from the new company. Mr. Cotten's wife, Ann, is the daughter of Howard and Ruth Mitchell, owners of the dealership. The couple met when they were both students at the Leelanau School in northern Michigan. Mr. Cotten projects a sales potential of 80 vehicles per month and 500,000 visitors a year to the showroom. Traffic is already up to about 300 visitors a week. Expansion is planned into a 40,000 square foot building at the rear of the old Empire Theatre where up to 200 vehicles can be shown. Downtown officials like Candace Bales, of the Downtown Management Board, are excited about the classic auto business and are planning expositions and other events that will tie in to the old car theme. Mr. Cotten states the aim of the business as: "seizing the opportunity to expand the area's economic base while becoming a globally pre-eminent re-seller and exhibitor of vintage, classic, neoclassic, muscle, specialty and investment vehicles, service, merchandise and accessories." "I love Bay City," says Mr. Cotten. "That's why I'm doing this." Another part of the business at the Water Street site is vehicle detailing and a laundry list of specialized car beautification services. Call 891-0900. Cross country transport services also are available through Bay City Motor Co. You can even buy die-cast models and accessories and soon auto related apparel will be on the racks.